It’s not you, it’s me. I’ve changed. I need more. I was trying to figure out how to break out of the rut we’ve been in for the past few months. I know we’ve had an on-again, off-again relationship, and took a full break for a year or two, but this time, I think this is it. I’m ready to move on now. I hate to admit it–I know this might hurt–but I’ve decided to start working with your competitor, Blogger. We’ve flirted a little behind your back, and I was always so jealous of how Blogger was treating all my friends, how they were looking so good together, and I finally decided just to take the leap. Good luck, WordPress. You’ve got a lot going for you. But we’re just not good together anymore. PS: If any of my four or five faithful followers wishes to check out the new look or keep on following me, you can find the new and improved Robin’s Song at robinbl.blogspot.com. Please change your bookmarks accordingly! Although you wouldn’t know it from the weather (we just woke up to three inches of snow this morning), Spring is (technically) here, and, of course, Easter isn’t far behind. I haven’t been much in the mood for cooking lately, or for posting recipes, since I kinda-sorta took the month of March off from dieting. I managed to maintain, but boy, I was just sick of Atkins for a while. I’m hopping back on the bandwagon again, though, for April, and the numbers on the scale are moving downwards once more. However, I think I’ll try blogging about things other than food once again, like the good ol’ days, just cuz I’m kind of in that sort of a mood. Also, I have been madly obsessed with decorating my house lately. I think I can attribute that to the weather as well. Not only am I sick of the brownish rolling hills behind my house, and the yellowish grass, and the dull brown sapling trees in my neighborhood, but the walls in my new house are painted brown from head to toe, and I have absolutely no curtains up anywhere, and all my ten-year-old furniture is looking more faded and dull every day. I am longing for COLOR! I find myself fantasizing about it. I have subscribed to about fifteen new home decor blogs in the past week which share a common theme of being bright and cheerful and filled with a rainbow of hues. Therefore, in honor of my current obsession, and in hopes that Spring will finally decide to get cooking, I will now present to you a bunch of BEAUTIFUL ideas for decorating Easter eggs. If the weather won’t oblige and you have no money for new furniture, some bright colorful eggs are a great cheap way to brighten your home and your day. (FYI–all of these are from Martha Stewart, who I don’t like much personally, but she sure does some beautiful crafts). A side note on this: I am a terrible mother. I hate doing crafts with my children. The reason for this is that I am too much of an artistic perfectionist. I have a hard time relinquishing control over the end product and just letting them make a mess and have fun. If you are like me, then maybe you could let the kids do their own thing, and then have your own station set aside for the stuff you want to display. Just an idea. P.S. Eggs are great for Atkins! I LOVE LOVE LOVE these eggs! You just take craft paper punches of different sizes and shapes and punch out several colors of tissue paper. Then you paint a thin film of decoupage gel, or Mod Podge, on a boiled or blown-out egg (if you’re the kind of person who has the patience to blow out eggs), or you could probably get some wooden eggs and paint them white. Pick up a tissue flower with your paintbrush, and paint over it with the gel. Sooooo bright and cheerful and cute! See video here. (The egg part starts at about 5:15). Martha also did some decoupage eggs using paper napkins with a beautiful cherry blossom design. She just cut out the flowers and painted over them, letting them dry between each piece. She got the napkins from a specialty store online (see here for details). I ADORE these eggs (and by the way, that’s totally the color scheme I want to use on my new kitchen). Most of us have probably used tape, stickers, or rubber bands to create interesting designs on eggs at some point in our lives. However, you can use this masking technique to get a nice print of a leaf or blossom on your egg as well. 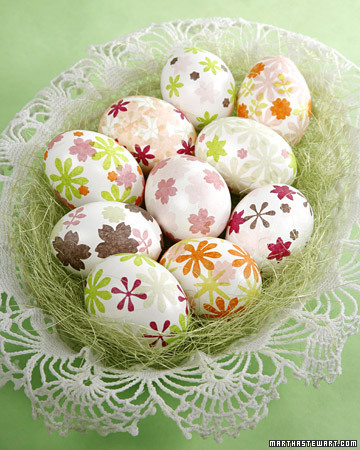 Use a small paintbrush to paint egg white on the back of the leaf or whatever and adhere it to your egg. Cut up a pair of old pantyhose into four-inch squares, lay the egg in the center of the square and pull the nylon taut around the egg, securing the extra fabric with string or an elastic. Again, dye the eggs for ten to fifteen minutes to achieve a high contrast image. Remove egg from dye and blot with a paper towel. Snip the string or elastic to remove the nylon and peel the leaf off. Dry on a rack. I love the delicate, intricate patterns you can get using this method! It’s so easy and yields beautiful results! All you do is get a wide strip of lace long enough to wrap around the egg with a couple of inches left over. Wrap the lace around the egg and twist the ends until tight, then secure with a small rubber band. Leave eggs in dye (which according to Martha, should be warm) for ten to fifteen minutes in order to create the greatest amount of contrast. After removing the eggs from the dye, blot gently with a paper towel and dry on a rack.